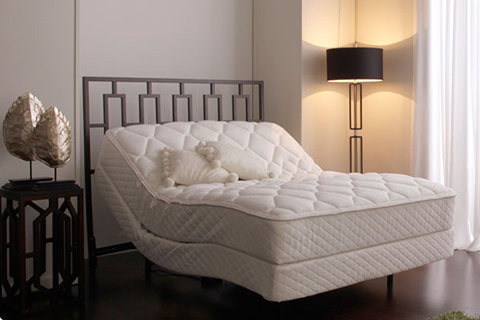 Leggett and Platt is a leading manufacturer of adjustable beds. Offering one of the most robust adjustable bed models in the industry, the company prides itself with products made only in the United States and offers long warranties, too. Made in the USA with 25-year warranty! When choosing from one of the many models that the company produces, it will be difficult to assess which model is right for you. Mattress Included: You’ll spend a pretty penny on the adjustable bed, but many only include the adjustable mechanism and not the mattress. If you don’t have a mattress already, keep this in mind during your purchase. There are a few that do offer a mattress. Split vs Non-Split: Split options are ideal if you have a partner sleeping with you. This will allow you to control each side of the bed independently so that both parties can get into a comfortable position. Weight Capacity: A concern for very heavy users is the weight capacity. If you’re in the obese range, make sure that the model you choose has a lifting weight that is higher than your body weight. Remote: Dual remotes are ideal for split beds. Wireless remotes are the best option and allow for a cleaner look. If you have trouble seeing, also consider the size of the buttons and if the remote illuminates. We’ve done a lot of the hard work already and have chosen a few models from the company’s lineup that are extremely well-rated and exceptional in quality. Adjustables Prodigy Adjustable Bed Review – The Prodigy comes in Twin, Twin XL, Queen, Split Queen and Split California King sizes. Offering a whisper quiet motor, this model allows for the feet or legs to be lifted either in one uniform manner or independently with the “split” models. Powerful, the motor can lift 600 pounds and there are apps to control the Leggett with your iPhone or iPod. A two-way remote is integrated into the bed if you don’t want to use an app and there are full body massage features in some models, too. This model has a one-touch flat button, programmable positions, remote locator (a dream come true) and variable height options, too. With a built-in gentle-wake alarm that wakes you up through audio or massage, this is one of the industry’s most robust models. Split King Size Leggett & Platt S-Cape Review – The Split King comes in a variety of sizes from Twin to Split California King (8 sizes in total), but the model we’re focusing on is the King. The King provides dual, full body massage to help you enter a pure state of bliss as you nod off to sleep. Wireless remote access allows you to select your desired position on or off the bed, and the buttons are illuminated and raised so you can even see them in the dark. No more turning on the light trying to reposition. A quiet motor allows your partner to sleep comfortably while you adjust your bed, and a wall hugger feature allows you to get close to your nightstand, too. Mattresses are not included, so this model is best if you have a mattress already. DynastyMattress S-Cape Adjustable Beds Review – A Twin XL model, this adjustable bed is offered as a mid to high range item and it is made entirely in the United States. One wireless remote is offered to allow you to quickly and easily adjust the bed day or not. Dual massage and wave action is available – it’s perfect for massaging out knots in your back after a stressful day – and there are programmable, memory positions, too. Simply program the right position for you, click a button and the bed will return to the position on its own. No more fiddling with the remote trying to find that perfect position again. There is a 12” thick memory foam mattress. A 20-year limited warranty is offered, and the feet and head can be adjusted independently for maximum control. With a 250-pound weight, this is a durable, long-lasting model. New Split King S-Cape Performance Model Adjustable Bed Review – One of the best split king models on the market today. this model has 4” legs with casters and has a maximum lifting capacity of 700 pounds. Made to be ultra-quiet, this model produces little noise during adjustments allowing both you and your partner to readjust without waking up the other person. An emergency power-down feature is available as well as wallhugger features which allow you to move the bed close to a wall or side table. There are dual massaging features with a simple on and off button as well as two programmable positions. When you want to put the bed flat, simply hit the “flat” button and the bed will do all of the work for you. With a wireless remote, readjusting the bed’s position is a breeze. Price: Adjustable beds are costly. There is no way around it when it comes to this level of quality. You’ll be looking at spending a decent chunk of change, and a mattress may not be included. Make sure your budget accommodates a mattress (some models do include the mattress) and also look into financing if money is a concern. Size: The size of the adjustable bed will have a direct reflection on the price of the bed, too. Twin beds are too small for two people to lay on, so this may not be a good option if you have a partner. And, there are all sizes of adjustable beds from Twin to California King (the largest size available). Massage: If you have arthritis or aches and pains, look for a model with a massage feature. This will lull you to sleep while also providing an exceptional massage. Alarms: Very few models offer an alarm function, but some high-end models do. This will be either an audio alarm or a massage feature that will initiate to wake you up. This is a very convenient feature. Programmable Options: If you want to be able to enter the exact position time and time again, programmable options will allow this. You’ll be able to program several positions that are recorded into the beds memory so that they can be reentered with a touch of a button.